My sleeping pill is taking long to kick in, so I fingered a poem on the WordPress mobile app. It was horrendous. Both using the app and the poem. I think I’ve broken a finger or two. Also I just shot the shot below from the app, zero editing. I can’t see how people can use the mobile app for posting stuff. I’m pissed off with it and this stupid idea of posting a pseudo poem hasn’t helped my sleeping at all. Eff that. I have used natural and other sleeping aids with mixed results. Hmm, natural sleeping aids don’t work for me, but the sleeping pills I have now are good. Mostly do their job. True. I experimented with this option but sleeping pills are ultimately cheaper. I had a night like that the other night but no sleeping pill and no cat…just me and I resisted all temptation to write about it as it was boring me to a feeling of RIP! 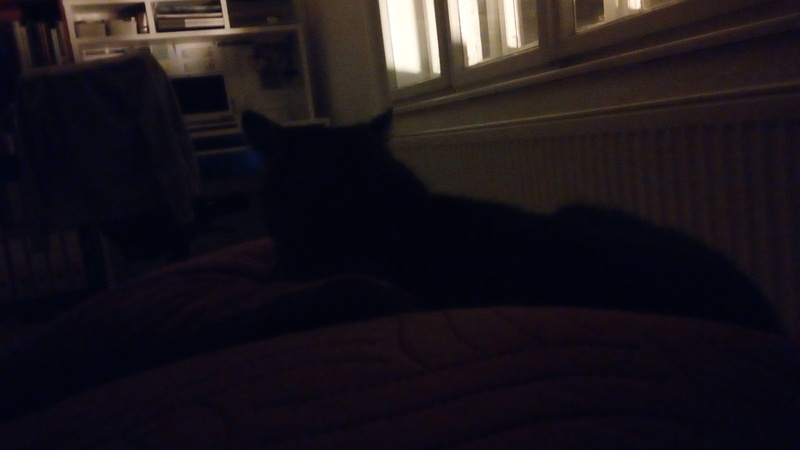 Sometimes a lack of cat is good – she’s creepy when she moves around the bed in the night… I’d like to read your insomnia post though! I mean, this impromptu post of mine is so terrible, yet it seems to be quite popular! I’m friend with all kinds of mobile apps, but not those that require you to type things. So inconvenient. I actually vented in my post and felt so relieved that I fell asleep immediately after posting it! Not sure if the cat is photo bombing or just stalking… Probably stalking. Both. The cat is always in my face or in between my legs. I mean, under my feet. Sometimes I regret I allowed her to sleep in the bed. She creeps me out sometimes when I wake up to her staring at me. I see cat ears!! Or is it batman..? I find the mobile app mostly good for scrolling through other people’s stuff, not so much for posting your own. In fact, I’m on the app right now! It’s my batman cat! The app is OK for scrolling, like you say, but I hate to type on the phone. I don´t like the app for posting either. I posted via it only once just to try it. It went OK, but it was mostly photos with minimum writing. I do like it for quick replies to comments, though.